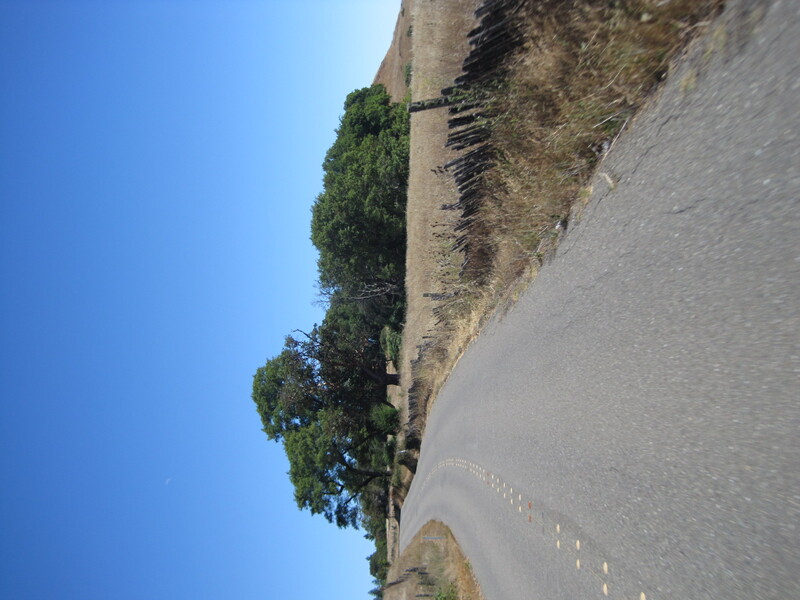 Hard hard road ride, a lengthened version of the King’s Ridge Loop. Five friends, two of them new. This time, I’m the slow poke! We opened with an aperitif’: the two hour drive on back roads in Franck’s impeccable white van, which got tea slopped all over the rug. Heading north, waving masses of Queen Anne’s Lace crowded the way like throngs of fidgety spectators under masses of white umbrellas. The ride was wonderful. Spent time with each–Matt Potts, Lou Peterson, Keith Howell, George Mazza and the great Franck, for whom this tour is now named–sorry, Franck. Some people have greatness thrust upon them. Speaking of chase, at the Skaggs descent, my inner bulldog broke off the tether and flew by the two guys in front of me. Sadly, I used a Very Original (=unpredictable) line. I.e., I was going too fast. Once past my hapless comrades, I had to bear straight for the mountainside, while WAILING on the (perfectly functioning and thank god silent) brakes. In the nick of time, (three inches of pavement left) I put my foot down and pivoted the bike. From then on, I kept out of their way and reconsidered all the early career dramas I endured because I was a squirrel. I guess an aware squirrel is better than a clueless one. Back in Santa Rosa, on Irwin Lane chez Keith/Paula, a feast was underway. Massive burritos, copious fillings, hella hubbub in the kitchen…it took a little prying to get us all away. Mega festive. Paula (and her sister Amy, mom Edie) fed us all! Came home ready to crawl into the bathtub and make the back pain dissolve. Dreamt of etch-a-sketch descents down curvy roads. ~ by jacquiephelan on August 17, 2010.
yay! that sounds like so much fun. i just got my first taste of “mountain biking” in the cairngorms. it was more like “fell biking”. we went between the hills… i would have loved to have you with us.